Kiev has threatened Sberbank, the largest bank in Russia and Eastern Europe, with sanctions. Some officials have even said that Sberbank, and all Russian banks, should be banned from the country altogether. Financial experts warn that doing so would trigger the collapse not just of the Ukrainian banking sector, but of country’s entire economy. Last week, the National Bank of Ukraine indicated that it would initiate sanctions against Sberbank’s Ukrainian subsidiary if the bank begins providing its services to the holders of passports issued by authorities from the self-proclaimed Donbass republics. According to the National Bank, if reports of Sberbank’s readiness to provide services to these clients are confirmed, it will approach the National Security and Defense Council of Ukraine to introduce sanctions against the Russian bank. The move comes on the heels of a decree by Russian President Vladimir Putin’s from last month which validated the ID, birth certificates, vehicle registration plates, and other documents issued by eastern Ukrainian authorities, on Russian territory. Last week, Sberbank’s Ukrainian subsidiary issued a press release indicating that the bank adheres to Ukrainian legislation, and does not serve and does not plan to serve clients based on documents issued by Donbass authorities on Ukrainian territory. The bank has indicated its readiness to serve people with Donbass documents in Russian territory, however, and this seems to be the core of Kiev’s charges. Financial experts suggest that the National Bank of Ukraine is factually demanding that Sberbank stop adhering to Russian laws, on pain of sanctions, other restrictions, or even nationalization. Economic observers have stressed that Sberbank is an important player in the Ukrainian commercial banking sector, and plays a significant role in ensuring the stability of the country’s banking system. Accordingly, analysts are divided over the implications of Kiev’s threats, and whether the government will really move forward with its threats. Economics professor Nikita Maslennikov believes that a move against the Russian commercial bank would be take a great deal of time and resources to implement, since there is no legal framework for doing so, particularly since Kiev will definitely be challenged in the International Court of Arbitration. 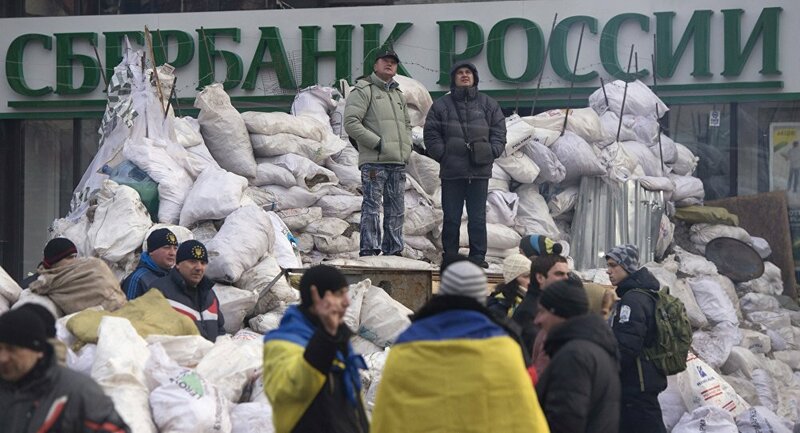 However, market analyst Mark Goikhman says that Kiev may move ahead anyway, not just for political reasons, but because sanctions could prompt the Russian bank to fold up its operations and sell of its assets, at a significant discount, which can then be bought up by Ukrainian oligarchs. In addition, the threat of sanctions alone may result in customers moving their savings to other banks. As far as Sberbank’s financial bottom line is concerned, Goikhman said that the fact of the loss of its Ukrainian subsidiary would be more significant than any financial losses it might incur. According to financial analyst Alexei Antonov, if Kiev does sanction the bank, more significant shocks will be sure to hit Ukraine itself. The analyst pointed out that the country’s banking system is very heavily dependent on foreign capital, with Oschadbank and the problem-ridden Privatbank being the only two fully Ukrainian-owned banks among the top-ten largest credit institutions. Foreign-owned banks, including Reiffeisen, BNP Paribas, City Group, Credit Agricole and others, including Sberbank, make up the rest. These other banks, many of which also operate in Russia, are required to work in accordance with Russian laws on Russian territory, and are therefore obliged to adhere to the presidential decree to accept the ID papers issued by Donbass authorities. Therefore, Antonov noted, if Kiev sanctions Sberbank, but not other foreign credit institutions, the Russian bank can simply appeal to Ukrainian and then international courts and accuse the National Bank of Ukraine of creation of non-market mechanisms aimed at limiting competition. In total, Russian banks occupy about 10% of Ukraine’s total market in banking services. Any efforts to sanction or even ban them could lead to a cascade effect affecting the whole sector, leading to a collapse not just of the banking sector but of the entire economy. Furthermore, Antonov stressed that even by itself, Sberbank’s withdrawal from Ukraine would not pass unnoticed by society, or the country’s economy. The bank’s considerable assets, including 11.4 billion hryvnia (about $425 million) in savings by citizens, and 7.4 billion hryvnia ($276 million) by commercial entities, would result in tremendous political problems for Kiev as well. With these factors in mind, the expert suggested that the question of which side would suffer more from sanctions against Sberbank’s Ukrainian subsidiary is really just a rhetorical one.